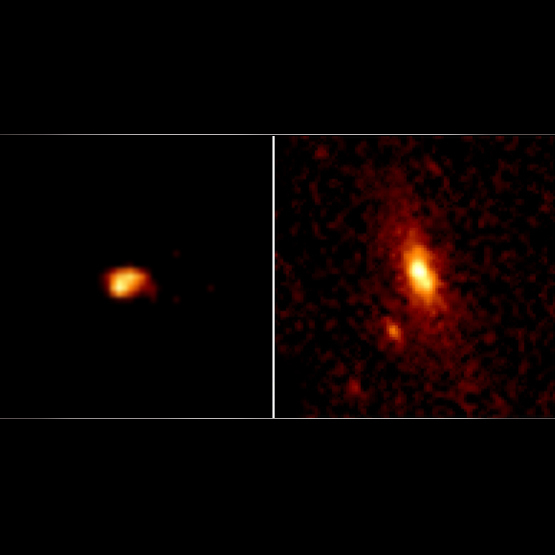 Type 2 Quasar: (Left) An image of a strong X-ray source. (Right) The optical image of the spiral galaxy where the X-ray source is located. Caption: This Chandra X-ray Observatory image shows a powerful point-like X-ray source that is consistent with energy emitted by a central giant black hole. The optical image of the galaxy does not show evidence that such a black hole is present. This inconsistency, combined with a deficit of low energy X-rays, indicates that this X-ray source may be a rare type of veiled black hole, called a Type 2 quasar. Scale: Image is 10 arcsec on a side.